A half-year after the European Space Agency formally prioritized high-energy astrophysics for its next flagship-class science mission, officials announced Friday the selection of a European-led X-ray observatory named Athena for launch in 2028. 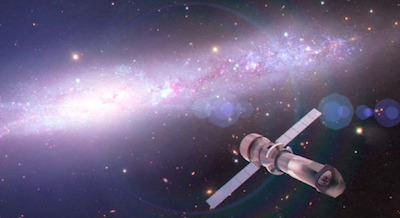 The huge telescope will replace ESA's XMM-Newton mission and NASA's Chandra X-ray Observatory, collecting data on the interplay between matter and black holes, halos of enigmatic hot gas enveloping faraway galaxies, distant gamma-ray bursts, and other phenomena. Athena will see objects fainter than XMM-Newton or Chandra, and it is the only X-ray telescope in its class slated for launch in the 2020s, ensuring high demand for Athena's data haul, according to scientists. The telescope will launch on a heavy-lifting rocket, possibly Europe's Ariane 5, and fly to the gravity-stable L2 Lagrange point a million miles from Earth for a five-year mission. Athena will weigh about five metric tons, or about 11,000 pounds, at launch. Its telescope will measure about 12 meters, or 39 feet, long with ultra-lightweight silicon pore optics, a new technology comprising stacks of silicon wafers to reflect high-energy X-ray light to the mission's two instruments. Missions like Athena must launch into space to see the universe in X-rays, which are absorbed by Earth's atmosphere, rendering observations from the ground impossible. Athena will look back in time to observe how galaxies and galactic clusters assembled a few billion years after the Big Bang, according to the mission's backers. The telescope will also resolve the flows of matter falling into black holes, contribute to exoplanet research, and survey the wider universe to map large-scale cosmic structures. "Athena will be a state-of-the-art observatory that will provide a significant leap forward in scientific capabilities compared with previous X-ray missions, and will address fundamental open questions in astrophysics," said Alvaro Gimenez, ESA's director of science and robotic exploration. "Its selection ensures that Europe's success in the field of X-ray astronomy is maintained far beyond the lifetime of our flagship observatory XMM-Newton." Officials announced in November that the next two large-class missions in Europe's Cosmic Vision program would be an X-ray telescope and a mission to confirm the existence of gravitational waves. The Cosmic Vision program is a strategic architecture for the selection of Europe's space science missions through a judicious process involving proposals, reviews and recommendations by the European research community. But the November decision in favor of X-ray and gravity wave missions did not come with a selection of specific mission concepts. For the first large-class, or L1, Cosmic Vision mission, ESA is working on an orbiter to be launched to Jupiter in June 2022. ESA's Science Program Committee last week signed off on the Athena mission for the L2 opportunity, and an endorsement of a concept for the L3 gravity wave research mission will come in 2020, with launch to follow in 2034. Athena was the only proposal submitted for consideration by the committee, officials said. Next comes detailed study and definition phases to mature technologies required for the Athena mission. ESA will also begin negotiations with potential partners, such as the United States and Japan, to contribute to the Athena mission. NASA officials have already stated their interest to provide components for Athena's scientific sensors. European Space Agency officials will meet again around 2019 for formal adoption of the Athena mission, setting a budget, plan and other details before industry begins construction of the spacecraft and its instruments.